Alison Johnson has a new video coming out about the need for fragrance-free policies. To learn more, and to download the full transcript, please visit the website. Alison Johnson has a long history of working to make MCS understood. Her website has films, books, and resources that she has created, as well as links to further resources. 20.2 % of the population reported that if they enter a business, and smell air fresheners or some fragranced product, they want to leave as quickly as possible. 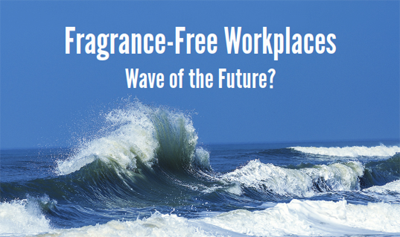 15.1 % of the general population reported that exposure to fragranced products in their work environment has caused them to become sick, lose workdays, or lose a job. This entry was posted in Accessibility, Air Quality, Environmental Health, Environmental Sensitivities, Fragrance, Health, Human Rights, Public Health and tagged Alison Johnson, allergies, Anne Steinemann, asthma, chemical sensitivity, Chemicals, fragrance-free, hazardous air pollutants, IAQ, MCS, multiple chemical sensitivities, petrochemicals, video. Bookmark the permalink. Thanks for continuing to get the word out. I’m never certain how to answer when people I run into ask how I am. I think I finally have settled on the response: “When I am away from toxic chemicals I am well. When I am exposed to them I am not well.” Your post made me think of that because I recently saw someone I worked with and hadn’t seen since I became disabled. The whole need for a fragrance free policy wouldn’t be necessary anywhere if we made a clean fresh air policy mandatory everywhere. Hope your squirrels are fat and happy and your air is clean and pure. Hoping one day soon we have the right to a healthy environment, instead of the right to pollute it. Some of the squirrels are losing a bit of weight this week, because it’s hard to get through 16-20″ of snow! But I am feeding the ones who can get closer, and I even dug out a few paths near the trees and hedge to sprinkle nuts and seeds for them and the crows. I bet if nature charged us for our usage we’d turn things around pretty quick. People get away with polluting because they don’t see the cost. That, and industries are not only subsidized directly, but they also get to externalize all the other costs of the adverse effects their business causes.